Occupy Wall Street protesters have set up an urban campground. NEW YORK (CNNMoney) -- Many of the Occupy Wall Street protesters might not realize it, but they got really lucky when they elected to gather at Zuccotti Park in downtown Manhattan. Contrary to what most people think, the park isn't a public space; it's actually privately owned by Brookfield Office Properties, which has approximately 18 million square feet in Manhattan, including the World Financial Center. And that's why the group has been able to stay there for 20 days. Zuccotti Park wasn't the protesters' original destination. The organizers first tweeted plans to gather at Wall Street's iconic Charging Bull Statue and at 1 Chase Plaza. But the New York Police Department got wind of that and barricaded both locations, which are city-owned parks that require protests to have permits. So Occupy Wall Street ended up at nearby Zuccotti Park, another large, open space that even boasts power outlets for a crowd that's very wired. The group is actually streaming some of the protest on its website. Ironically, the protesters don't need a city permit to occupy private property. And so far, while the police have maintained a strong presence in the area, they have yet to try to remove the protesters. Brookfield, the NYPD and the office of Mayor Bloomberg have all declined to comment on exactly how things at Zuccotti Park are being handled. "The good news," according to Christopher Dunn, the associate legal director of New York Civil Liberties Union, "is that the police are taking a pretty accommodating approach to the park itself, and that has help avoid confrontation this far." What Brookfield has said is that the park rules are clearly posted. They ban tents or other structures, as well as the placement of tarps, sleeping bags or other coverings on the property. 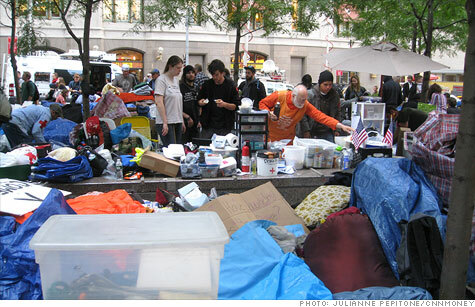 And it's obvious that Occupy Wall Street is violating most if not all of those rules by turning the spot into a sort of urban campground. Protesters have been in the park rain or shine, taking over the entire space, including benches with supplies, tarps, sleeping bags as well as organized "stations" devoted to medical and food supplies and legal, media, and security matters. Some even sleep in the park, something that would be impossible in the city-run parks which close at 1 am. Brookfield has issued a statement expressing concern about the conditions on its property. "Unfortunately, many of the individuals currently occupying the grounds are ignoring [our] basic yet necessary requirements, which interfere with the use of the park by others, including local residents, office workers, and visitors," the company statement explains. It adds that "sanitary conditions have reached unacceptable levels." Every weeknight litter is normally removed from the park, the plaza is power washed and landscaping is tended do. But because of the protesters, none of that maintenance has been performed since Friday, September 16. Brookfield says it recognizes the people's right to peaceful protest but that it has to maintain the park's safety, cleanliness, and accessibility to everyone. It says it's working with the City of New York to address these conditions, but declines to say what steps they are taking, or what it would take to remove the protestors from the park. In less than three weeks, the movement made-up largely of twenty-somethings has become a magnet for countless disaffected Americans, including the AFL-CIO and SEIU labor unions. Occupy protests are also being held in dozens of other cities, such as Chicago, Los Angeles, Seattle and Boston. From the start of the New York City protests, organizers have said they hope to occupy Manhattan's Financial District for two months. At this point, they're nearly half way to that goal.